It is often that we ask photography to confirm our existence. Old photographs, in this light, become irresistible. They become mirrors of what we are, what we have been, reflecting our reality, our significance, and ultimately, our history. The extensive collection of Philippine photographs dating back to as early as 1860 confirms beyond doubt photography’s role in forming our national experience, documenting what was to be the emergence of our identity, however encysted we were in our colonizer’s culture then. The earliest photographs of a Filipino were known to have been taken by a French engineer in 1860. The stereoptic photographs were that of the Tingguian tribeswomen of Abra. The natives’ portraits showed stiff expressions as if in fear of their photographers who had their heads and shoulders tucked into black boxes called cameras. A much earlier encounter with photography was said to have been made through a Spanish agent, Don Sinibaldo del Mas, who journeyed to the islands to make recommendations on the future of the Philippines as a Spanish colony. Upon finding himself destitute in 1841, he decided to sell photographs of the country to support himself. With the rise of Manila’s first studios in the 1860s, exchanging photos became fashionable through the 2 ½” by 4 ½” paper prints called cartes-de-visites which were mounted on cardboard and featured natives in various costumes and occupations. It is this quality of photography to document which made it possible for us to record the historic flourishing of commerce during those times, especially in Escolta. 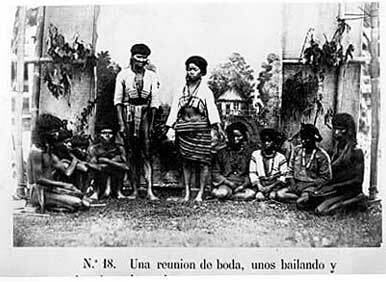 Kalinga Wedding, circa 1910 Photo of a Kalinga couple preparing for a wedding dance of the “ganzo”, or brass instrument. Taken from Photographs of Aborigines of the Philippines, No. 18. Pilipinas Photography. (Jan-Feb 1989). Vol. 1 No. 2, p. 18.